Enoch SMART was born on 16 August 1844 in Moulton, Northamptonshire, England and was baptised in the same place on 1 December 1844. With the rest of his family, he came to New Zealand on the Randolph in 1850. For most of his career, he was a general labourer, first in Templeton, then to Prebbleton, and then out to Kirwee. 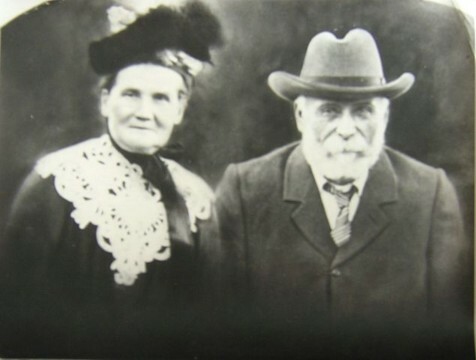 He married Margaret GOODWIN on 1 May 1867 at St Peters Church in Riccarton, Christchurch, Margaret was born on 29 September 1846 at Greenwich, England. She died on 2 August 1934 in Christchurch and is buried in the Sydenham Cemetery in Christchurch. Enoch died on 10 March 1907 at the Christchurch Hospital in Christchurch and was buried on 12 March 1907 in the St Saviours Church Cemetery in Templeton. Eleanor Mary SMART was born on 13 January 1868 and was baptised on 23 February 1868 in Templeton and died about 1946. She married Herbert Peach BRAKE about 1904. They had one child. Frank SMART was born on 28 August 1869 in Christchurch and was baptised on 23 November 1869 at the Roman Catholic Cathedral of the Blessed Sacrament in Christchurch. He died on 3 October 1870 and was buried in the St Saviours Church Cemetery in Templeton on 7 October 1870. Lucy Jane SMART was born on 26 February 1871 in Prebbleton, near Christchurch and was baptised at the Roman Catholic Cathedral of the Blessed Sacrament in Christchurch on 31 March 1871. She became Sister Mary De Sale's of the Home of Compassion in Wellington and later died, and is also buried in Auckland. Grace SMART was born on 5 November 1872 in Stoneycroft, near Christchurch on died on 10 March 1874 in Christchurch and was buried in the St Peters Church Cemetery in Riccarton, Christchurch on 13 March 1874. Grace Delia "Bridgett" SMART was born on 4 May 1874 in Stoneycroft, near Christchurch and was baptised on 27 May 1874 at the Roman Catholic Cathedral of the Blessed Sacrament. She died on 11 June 1902 in Darfield and is buried in the Darfield Cemetery. May SMART was born on 7 April 1876 in Templeton and was baptised at the Roman Catholic Cathedral of the Blessed Sacrament on 20 April 1876. She died on 6 April 1877. Alice May SMART was born on 25 May 1878 in Christchurch and was baptised on 15 June 1878 at at the Roman Catholic Cathedral of the Blessed Sacrament, and died on 30 August 1948 in Christchurh and is buried in the Darfield Cemetery in Darfield. She married George Kennedy HOSKING on 6 February 1907 in Christchurch. They had three children. Amy Gertrude SMART was born on 3 February 1880 in Hornby, Christchurch and was baptised on 28 February 1880 and died on 16 January 1938 in Wellington and is buried in the Karori Cemetery in Wellington. She married Thomas GREGAN on 18 November 1902. They had six children. Arthur Horton SMART was born on 23 November 1881 in Hornby, Christchurch, and was baptised in Christchurch on 21 December 1881 and died about November 1945 in Kirwee, near Christchurch. He married Elizabeth PAGE about 1914. They had two children. Elizabeth Florence SMART was born on 26 May 1883 in Hornby, Christchurch and was baptised at the Roman Catholic Cathedral of the Blessed Sacrament on 23 June 1888 and died on 22 August 1976 in Templeton and is buried in the St Saviours Church Cemetery at Templeon. She married Thomas GRIFFITH about 1906. They had two children. Frank Sydney SMART was born on 4 July 1884 in Hornby, Christchurch and was baptised at the Roman Catholic Cathedral of the Blessed Sacrament on 30 July 1884 and died on 6 July 1948 in Wellington and is buried in the Karori Cemetery in Wellington. He married Ada MAIDENS about 1917. They had one child. Lilly Taroice SMART was stillborn on 5 September 1888 in Kirwee, near Christchurch.